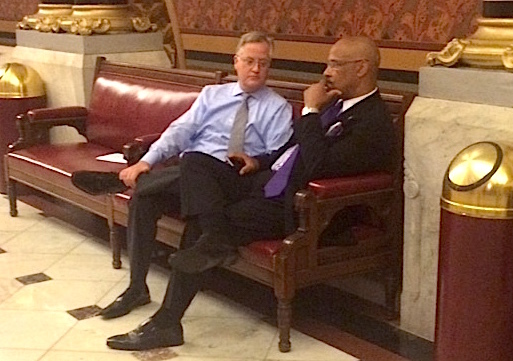 House Speaker J. Brendan Sharkey talks with the majority leader on the phone while the chamber votes on the budget. 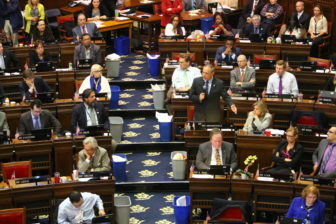 Connecticut’s long-running budget drama began drawing to a close early Wednesday as the House of Representatives adopted a $40.3 billion, two-year budget package that largely restores deep cuts to social services and expands municipal aid while bolstering tax revenues by almost $2 billion. 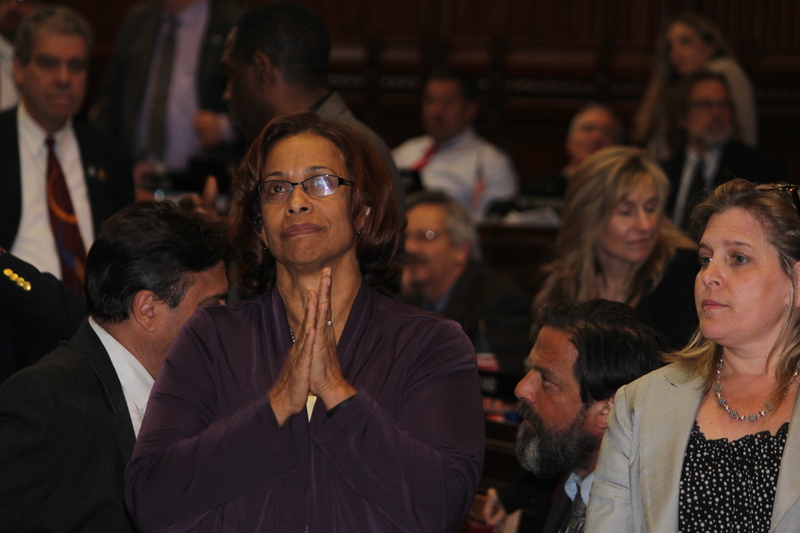 The budget, which was negotiated by Democratic majorities in both chambers and Gov. Dannel P. Malloy’s office, now moves on to the Senate, which has until the legislative session hits its adjournment deadline at midnight to act. The package also makes an initial investment — albeit a limited one — in Malloy’s initiative to rebuild and enhance Connecticut’s transportation infrastructure. The budget, which spends $19.82 billion in 2015-16 and $20.47 billion in 2016-17, also relies on a controversial interpretation of the constitutional spending cap to avoid shattering that limit. The package would boost spending in the general fund — which covers the bulk of annual operating costs — by 4 percent in the first year and by 3.1 percent in the second. Those tax policy changes sparked protests and threats from some of Connecticut’s largest employers, who warned that the overall tax burden — and particularly controversial sales and corporation tax hikes — would drive employers from the state. House Majority Leader Joe Aresimowicz give the final remarks on the budget before the vote. “The middle class got a tax increase four years ago,” Alexander said afterward, referring to an across-the-board income tax hike adopted then to close a major deficit. The new budget would collect another $150 million from middle-income families. “They have to create jobs, and I personally think this [budget] is going to hurt business in Connecticut,” Rovero said afterward. House Majority Leader Joe Aresimowicz, D-Berlin, reminded Republicans – who called for state employee concessions – that workers gave back in 2009 and 2011. 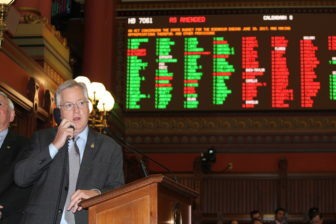 Aresimowicz added that the budget, though not perfect, preserves the services that help Connecticut’s most vulnerable. Rep. Toni Walker, co-chair of the legislature’s Appropriations Committee, watches the vote board in the House. And Rep. Toni Walker, D-New Haven, co-chair of the Appropriations Committee, said her panel met with over 4,000 individuals and read more than 2,000 pieces of written testimony. 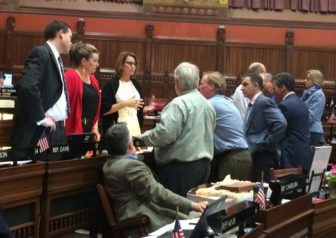 The message was not to allow the deficits to harm health care, social services, education, parks, cultural programs and other services that add to Connecticut’s quality of life. But Rep. Chris Davis of Ellington, the ranking House Republican on the legislature’s Finance, Revenue and Bonding Committee, said public opposition to tax increases also was strong, and added that their frustration with state officials is clear. Democratic leaders watch the vote on the budget. 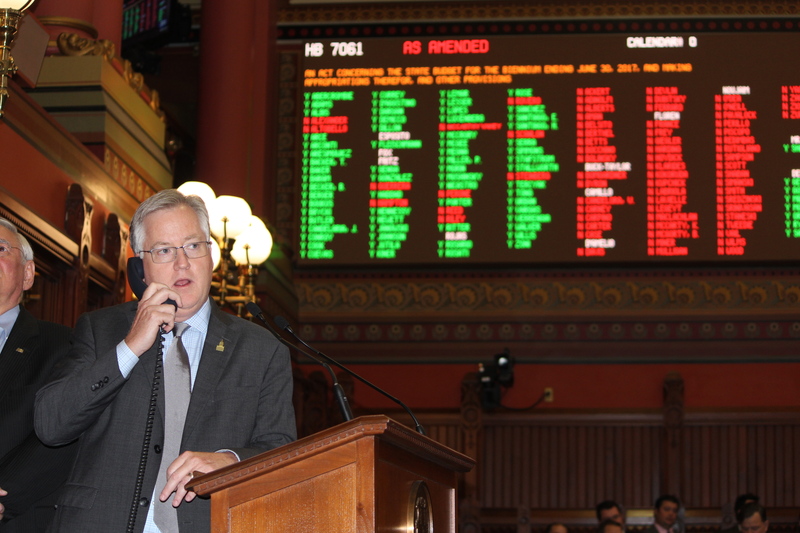 Another portion of the sales tax receipts would be used to enhance Connecticut’s system for reimbursing cities and towns for a portion of the revenue they lose because of tax-exempt property owned by the state, private colleges or hospitals. Communities will be required to pay more for resident state trooper services. Towns currently pay 70 percent of the cost of troopers’ compensation, but that cost rises to 85 percent in the new budget for the first two troopers, and to 100 percent for all troopers beyond the first two. The cuts include reducing Medicaid eligibility — a move expected to cause 20,000 to 25,000 poor parents to lose coverage — and requiring seniors to pay more for home care. Programs that serve people with intellectual or developmental disabilities would face modest cuts, not the huge reductions Malloy proposed. Republican legislators gather around House Minority Leader Themis Klarides before the beginning of the budget debate. Sen. Beth Bye, D-West Hartford, co-chair of the budget writing committee, said many line items will be cut by 6.25 percent. She said legislators tried to avoid cutting human services. “That led to challenges, because so many of the moneys that are discretionary are the human services,” she said. With this new funding, enrollment in charter schools is set to exceed 9,000 students statewide, a 14 percent increase; and magnet school enrollment will approach 40,000 students, a 5 percent increase. 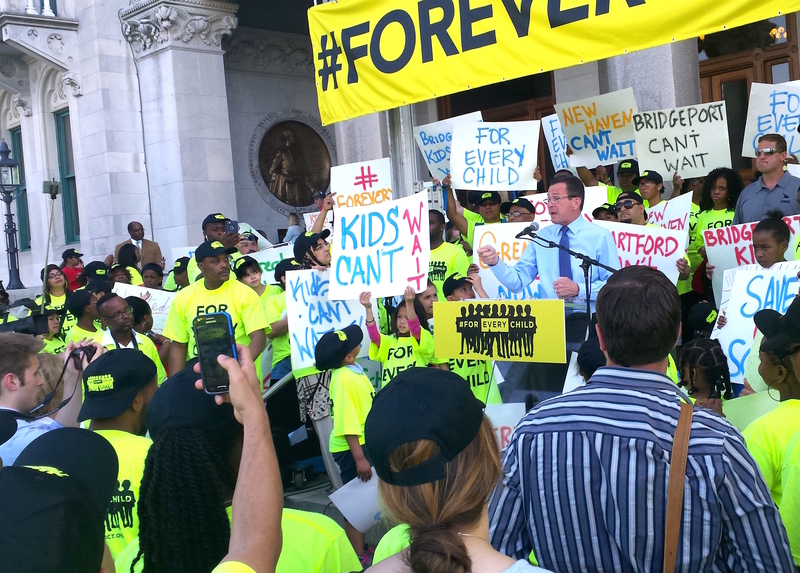 Additionally, Open Choice — a program that offers students in Bridgeport, Hartford and New Haven enrollment in nearby suburban schools – will be expanded. Gov. 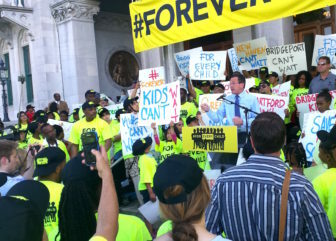 Dannel P. Malloy addresses a rally of charter school supporters at the state Capitol last month. However, two grants that help the state’s lowest-performing schools will decrease. The Commissioners’ Network — a group of struggling schools targeted for state intervention and funding — will get $4.7 million less than was provided in the state budget for this school year. The state’s 15 Priority School Districts will lose $3.6 million that helps extend the school day and offer summer programs. The budget decreases funding for the state’s largest public college system, the Connecticut State Colleges and Universities, by $8.2 million – which leaves the system with a nearly $22 million budget deficit. Funding for the separate University of Connecticut would increases by $10.9 million. That support will help the state’s flagship university increase pay for unionized staff and hire increased staff to boost enrollment in science, technology and math — an initiative known as Next Generation. Speaker J. Brendan Sharkey speaks with Rep. Ernest Hewett of New London at 4 a.m. Wednesday. The budget cuts funding for student scholarships at the state’s private colleges by $2.2 million. The cuts would eliminate state-funded scholarships for students attending schools with large endowments, including Trinity College, and Quinnipiac, Wesleyan and Yale universities. 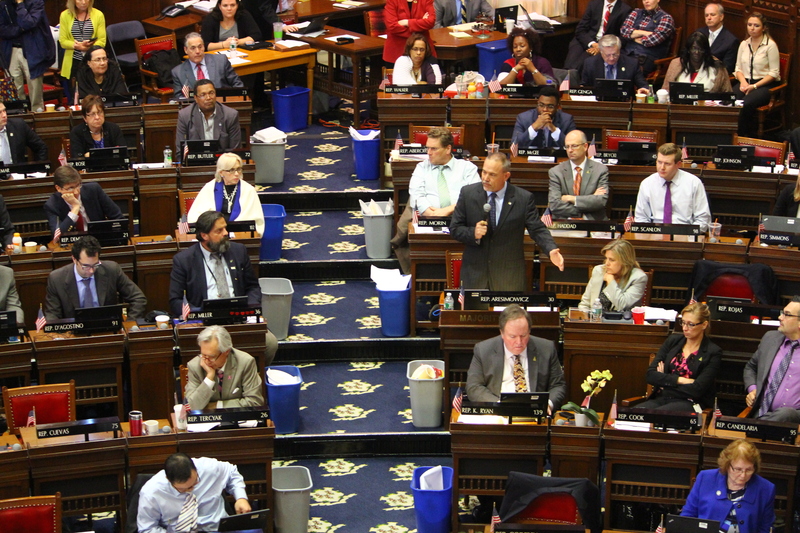 The budget raises about $300 million from Connecticut’s wealthiest households by establishing two, new top marginal rates. 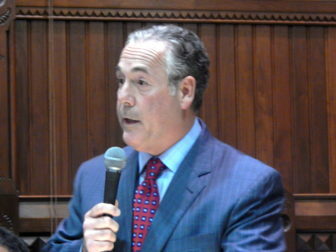 Rep. Jeffrey Berger, co-chaiir of the Finance, Revenue and Bonding Committee speaks during the budget debate. The budget deal almost fell apart in the final days as many rank-and-file members of the House and Senate’s Democratic majorities balked at raising income taxes on the middle class. Previously approved, smaller income tax cuts – involving increasing credits for the working poor and individual filers – both were delayed. 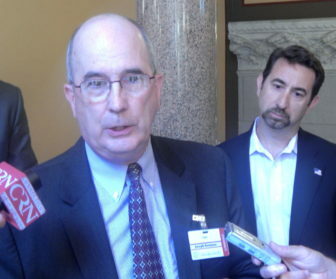 Joseph F. Brennan, president and CEO of the Connecticut Business and Industry Association, talks with reporters. The Connecticut Business and Industry Association particularly balked when lawmakers agreed to a change that had been intermittently proposed — and rejected — for more than a decade. It involves canceling what the Connecticut Business and Industry Association (CBIA) argues is one of Connecticut’s few business tax advantages over other states. At issue is how companies with operations in multiple states report their corporate income. In Connecticut, companies largely have to report only the earnings of their in-state operations — a requirement that critics charge allows corporations to hide profits among out-of-state affiliates, and thereby minimize their tax bill here. The new budget shifts to a unitary reporting requirement. This would compel companies to share information on all of their operations — both in Connecticut and outside — and undergo a more detailed assessment of what profits are tied to their presence in this state. Hospitals used to receive the full $350 million tax back from the state — plus additional money — as part of a complicated arrangement to help Connecticut qualify for more federal Medicaid funding. But the state’s payments back to hospitals have dwindled in recent years, and now the industry gets back just under $96 million per year. Hospital reimbursement payments will grow under the budget to $256 million per year, but the overall gap between what the industry pays and what it receives back has widened. Consumers will lose a huge sales tax break they were promised last year — one that Malloy and many legislators campaigned on last summer and fall. A typical keno game in New York: A video screen with the 20 numbers drawn from a field of 80. Connecticut’s $3.40-per-pack rate would climb by 25 cents on Oct. 1, and then to $3.90 on July 1, 2016. Rep. Jeffrey Berger, D-Waterbury, co-chair of the finance committee, said the launch of keno is not about a quick revenue grab, but rather providing a game that’s essential for the Connecticut lottery to remain competitive with other gaming programs both here and in other states. “They said ‘we need your help to be competitive,'” Berger said. How legislators voted. Rep. Jason Rojas voted at the last minute in favor. 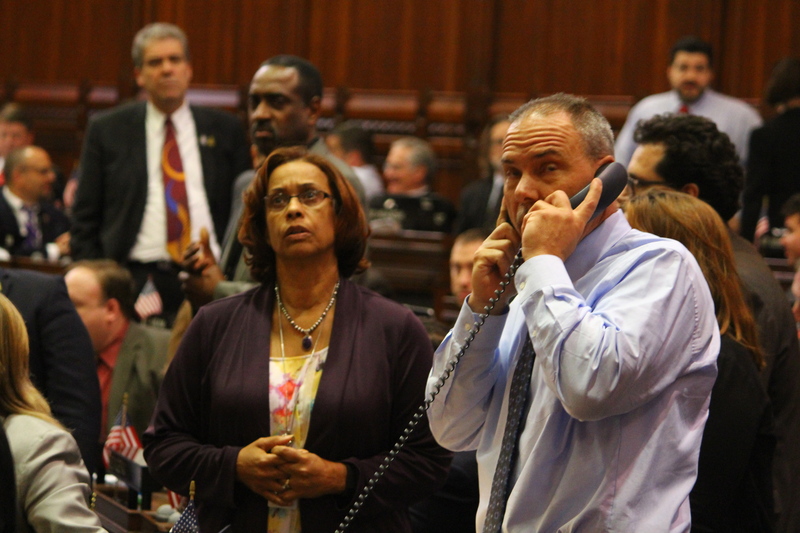 Eight legislators missed the vote.